This is looking north from the highway berm; the slope in the upper mid-left more or less represents the western half-graben of the High Cascades Graben (See "Day 24: Close Enough," above). 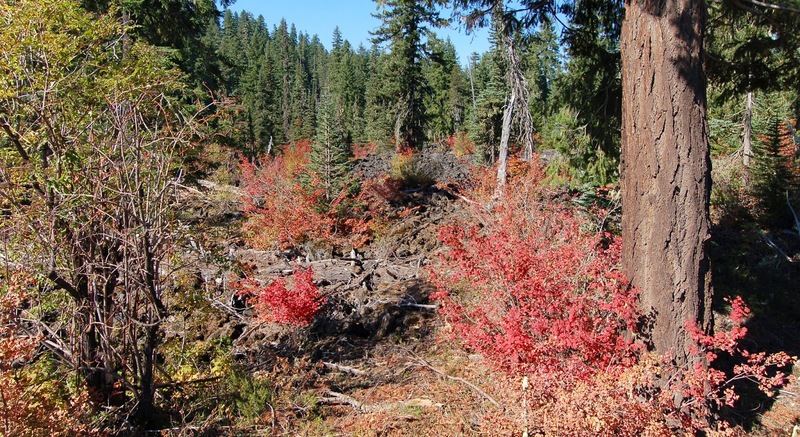 But what really delights me about this photo is the bright red vine maples, echoing the recent fire of this flow. I'm not sure whether this particular lava flow is from Nash Crater or Little Nash Crater, but it's almost certainly one of those two. There were a number of recent flows from a line of cinder cones east of here about 3000 years ago. Photos stitched in HugIn. October 9, 2012. FlashEarth Location. Geo 1095: March 25, Day 814: Ignimbrite!